American painter, born in Boston, Massachusetts on the 24th of February 1836. At the age of nineteen he was apprenticed to a lithographer. Two years later he opened a studio in Boston, and devoted much of his time to making drawings for wood engravers. In 1859 he removed to New York, where he studied in the night school of the National Academy of Design. During the American Civil War he was with the troops at the front, and contributed sketches to Harpers Weekly. The war also furnished him with the subjects for the first two pictures which he exhibited (1863), one of which was "Home, Sweet Home." His "Prisoners from the Front" -- perhaps his most generally popular picture -- was exhibited in New York in 1865, and also in Paris in 1867, where he was spending the year in study. Among his other paintings in oil are "Snap the Whip" (which was exhibited at the Philadelphia Centennial Exhibition of 1876, and, in company with "The Country Schoolroom", at the Paris Salon the following year), "Eating Watermelon", "The Cotton Pickers", "Visit from the Old Mistress, Sunday Morning", "The Life-Line" and "The Coming of the Gale." His genius, however, has perhaps shown better in his works in watercolor, among which are his marine studies painted at Gloucester, Massachusetts, and his "Inside the Bar", "The Voice from the Cliffs" (pictures of English fisherwomen), "Tynemouth", "Wrecking of a Vessel" and "Lost on the Grand Banks." His work, which principally consists of genre pictures, is characterized by strength, rugged directness and unmistakable freshness and originality, rather than by technical excellence, grace of line or beauty of color. He was little affected by European influences. His types and scenes, apart from his few English pictures, are distinctly American -- soldiers in blue, New England children, negroes in the land of cotton, Gloucester fishermen and stormy Atlantic seas. Besides being a member of the Society of Painters in Watercolor, New York, he was elected in 1864 an associate and the following year a member of the National Academy of Design. 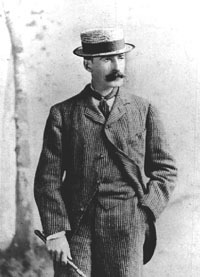 Somewhat of a recluse, Winslow Homer never married.